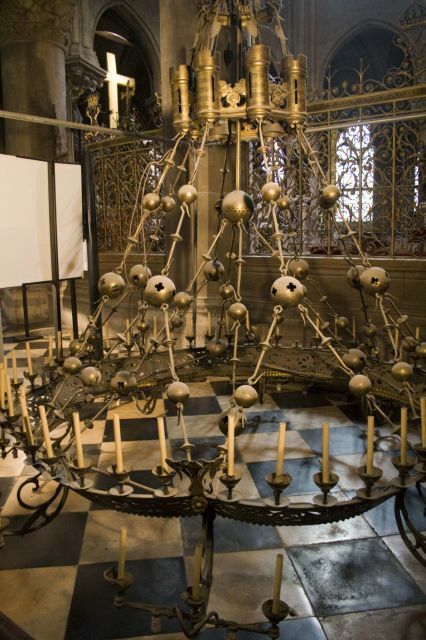 This is a large chandelier that is taken down for restoration in the Cathédrale Notre-Dame-de=Paris. They are renovating the lighting system, and if this chandelier follows what has happened to the others, unfortunately it will be LED. The other chandeliers have that annoying cheap Chinese Christmas light flicker. It seems it collected a lot of dust over the years. Nothing can escape the LED. Was it dummy with candles untill now ? This looks like a candles based chandelier. There are no ways to convert it to an electrical fixture. The only option is to replace it with a new electrical chandelier. It has been converted to electricity some time ago. If you look at the full size image, you can see wires especially in the cups holding the candles. And.... How about glow discharge lamps ? Are there incandescent christmas lights inside the "candles"? I think this chandelier had incandescent lamps, but they were removed when it was taken down. I could not see any kind of lamp, but it is obvious by the amount of dust on the wires that there was something in the candles (ie the wiring is not new). If I were to decide what goes in there, it would be incandescent lamps as that is what gives the closest colour of real candles. Unfortunately, the other chandeliers in the cathedral were relamped with LED. As Raphael put it, nothing can escape the LED. I saw a news article this morning that intonated that this most famous of buildings has caught on fire. Yeah pretty shocking to hear what happened today. It sounds like the entire roof collapsed now so it seems unlikely this survived, unfortunately. I've seen pictures from the aftermath, taken at midnight. It seems as if most of the interior survived. There are holes in the vaulted ceiling, though, but most of it appears intact. That is according to lemonde.fr, a French daily newspaper. In vaulted ceiling architecture, it is somewhat deceiving as the summit of the vaulted ceiling is well below the summit of the outside roof. What you see inside and what you see outside are separated by much more distance than you think. The roof collapsed, but the vaulted ceiling inside stayed mostly intact. A fundraising campaign was launched and I believe it will be rebuilt. It will take a long time, though. One image showed a lot of scaffolding around the structure...so what started it? ....Somebody welding up there and sparks dropped into the ceiling space between the roof and vaulted ceiling....where I could imagine there would have been a far few old bird's nests??? Or maybe a cigarette? A few years ago there was a massive fire at a pallet and cardboard recycling company here in Columbus that was started by 2 employees (probably now former employees), smoking in the storage yard (a MAJOR NO-NO! ) That mess burned for almost 2 days! Meanwhile, the media is reporting that the structure is globally saved, however the fire is not completely out yet. There are extensive talks about fundraising and starting to rebuild. Whatever happens regarding rebuilding or restoring, it will be a decades long project most likely. There are quite a lot of things the Chinese government don’t want you to know. Btw, the Qing dynasty isn’t even established by genuine Chinese, they are invaders too. I hope your Church would be reconstructed. The Israeli media said that the fire caused because of a short circuit. I don't think they had LED filament bulbs in 2012. Me too, but in these years maybe can used ugly LED corn lamps! In 2012, when this picture was taken, the other chandeliers in the basilica had clear plastic lamps with an opaque white cup around the base. They had a series of diodes visible from the ground. They were between 3000K and 3500K and had a CRI in the 70's at best. They had a very annoying 100Hz flicker. When I visited in 2007 and in 2009, they were all incandescent and looked very good and had a nice quality sparkling light. Now, I'm not sure what type of lamps they had recently, but I can imagine if they had nice high quality 3000K or lower, high CRI, flicker free filament LED, then it would look quite good. I am quite sure they will install all new lamps during the restoration.